This week I headed over to Wakefield for the bi-monthly Artwalk. The Artwalk happens on the last Wednesday of the month and consists of all the various art spaces and galleries opening to members of the public till late. The event is a good opportunity to see new artworks and meet the artists involved. It promotes a grassroots ethic to support engagement in the arts by and for the local community and is promoted and managed by The Arthouse, which incidentally was my first stop for the evening. Upon arriving at the Arthouse I was immediately confronted by 2 large scale wall mounted photographs by artist Bob Clayden. As he explains in his artist statement: ‘The images in this exhibition were made over a six month period in and around the former library on Wakefield’s Drury Lane, as the building began a gradual transition from library to art space. 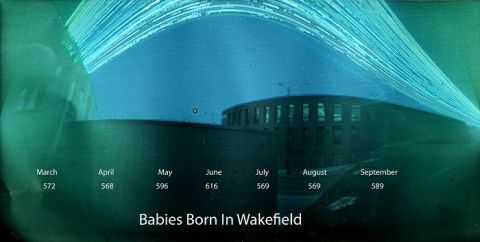 Made using a solargraphic technique, pin-hole cameras were placed inside and outside the building to record the changing architecture and sky in single long-exposure images. Part artwork, part informational diagram, the photographs seemed to be trying to express many different ideas at once and could perhaps have benefited from being produced as separate bodies of works. However, I was struck by the idea of a contemporary version of a solar chart, where events are calculated and divined by their relation to astral activity, so I decided to stay for the artist talk to find out more. Bob began by giving a very practical introduction to the way that the images had been made by explaining the process of using a pinhole camera and showing us the cans that he’d used to create his images. Rather than calling them cameras however, he referred to them as ‘solar collectors’ to stress the difference in the way that they recorded images. It was interesting to see the material objects behind the development of the work and I wondered if that was something that he could include in future exhibitions. However my main interest was in how he created the aesthetic of the images. After exposing the image to photographic paper for the desired length of time, he removed the paper from the ‘camera’ under darkroom conditions, and then instead of using chemicals to develop the work, he scanned the image into the computer. This process created a colour negative of the image which was then inverted in Photoshop. This process of combining primitive photographic techniques with modern technology suggested a further level of alchemy that I was keen to pursue in the reading of the work, with its references to solar collection and astrological patterns. However, when I questioned the artist about it, he was reluctant to address any sort of alchemical or early modern scientific interpretation. I started to consider the possibility that I had begun to interpret any images I saw in reference to my research and interests. Despite this concern, it seemed like a pertinent suggestion, particularly in context of the earlier photographic experiments of Sigmar Polke, Susan Derges and Anne Hammond, etc, so I decided to reflect on the material processes of the solargram in relation to using it to create images for artist books. Although I’m very much a maker of objects, I’m also interested in the relationship between the online and offline, particularly since my transfer meeting and the discussion about Digital Humanities in relation to my topic (in week 41). Digital Humanities spans across disciplines, but is especially relevant in the fields of museums and archives, where digital media has appeared to bridge the gap between conflicts of accessibility and conservation. This week, the Audiovisual Archives and Contemporaneity conference at the University of Leeds, invited speakers from various national and regional collections to discuss their perspectives on these new opportunities and challenges. Dr Tom Rice discussed his role as a senior researcher on the Colonial Film project, a collection of footage capturing images of life in the British Colonies. It was interesting to hear about the methodological decisions and challenges relating to developing an online archive resource. The three main contributors to the Colonial Film Project (BFI, Imperial war museum and the British Empire and Commonwealth Museum), each had their own cataloguing system which needed to be standardised when brought together as a collection. The selection process was another interesting topic because, as every item couldn’t be digitised, decisions about which material should be included needed to be discussed and justified. Additionally, selected footage should be representative of the whole collection, not just sensationalised imagery, to avoid creating a false archive. Finally, he discussed how essays were included to contextualise each of the collections and shown in dialogue with the films to create a new interpretive resource. Other presentations discussed the unique attributes of digital technologies to create and share moving images with new audiences. Bryony Dixon, Curator at the British Film Institute, showed an example of chronophotography which had been digitised on vine, while Sue Howard from the Yorkshire Film Archive shared her experience of working with the Harrogate-born man who shared his own archive of pictures of his son and went on to create the YouTube video 21 Years. Digital technologies, as well as collating and sharing archives, can also be used to create new archives, particularly in the case of curated online content or digital storytelling. For example, Simon Popple, discussed a previous AHRC/BBC project that he had worked on called the Open Archive Project, in which he had worked with communities from the North of England to re-examine BBC footage of the miners strike and to frame it in the context of their stories and memories of that time. Despite the range of possibilities however, this creates an interesting technical and philosophical conundrum when these digital archives become cultural artefacts in themselves, or indeed when the collected artefacts are already digitally native. The Whitney Museum of American Art faced such a dilemma recently when reinstalling their first Internet-made artwork, which they acquired back in 1995. The World’s First Collaborative Sentence, created by artist Douglas Davis, was an early example of interactive art which included around 200,000 typed contributions from users all over the world. However, upon reinstalling the work last year, they found that the piece no longer worked. They were faced with a decision about how to recreate the piece, either adhering to the historical integrity of the original code and reinstalling it as it was created, despite its degraded state, or to rewrite and restore the functionality of the work in accordance with new technological specifications, so it could be used as it was originally intended. After considering several possibilities they decided on a solution which would satisfy both criteria: to display it in both its original and updated form. Somewhat paradoxically however, the original version of the work, despite being frozen, still shows the contemporaneous response of the work to 20 years of digital development, as opposed to the updated version, which replicates the programme as it was when it was first conceived, creating an interesting sense of historical flux. While I was down in London I had the chance to visit The Museum of Contemporary African Art. However, despite its grandiose title, The Museum of Contemporary African Art is not a museum by traditional standards at all, but is in fact a 12 room installation by a single artist, Benin-born Meschac Gaba. 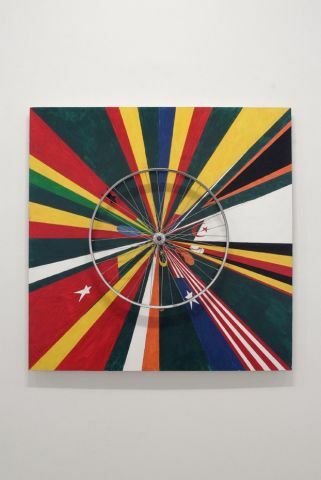 Now installed at its current home at the Tate Modern, Gaba’s work represents the largest single artwork purchased by the Tate. The idea of the museum first developed when Gaba visited the Rijksakademie in Amsterdam for a residency in 1996. Through exploring European art museums he realised that not only were contemporary African artists not represented within the artistic canon, but contemporary artworks that had been brought from Africa were being sold and marketed as traditional crafts. It was this experience that inspired him to create a museum as a space to exhibit his own work. The museum is separated into themed rooms which suggest both both typical curatorial concerns, as well as alluding to the architecture of the museum. The rooms, which include a museum shop, restaurant and library, explore the familiar subsidiary elements of Western art museums as art spaces in their own right, where participants are invited to consider the boundaries of institutional participation. In other spaces such as the marriage room, Gaba showcases his own marriage to Alexandra van Dongen that took place on 6th October 2000 at the Stedelijk Museum in Amsterdam. Presents, wedding attire, a guest book and marriage certificate from the ceremony, come together to make up the museum display, and to break down the barriers of art and life. In the game room and the architecture room, visitors are actively encouraged to physically engage with the objects on display to create new objects through the use of wooden puzzles and building blocks. Through subverting the function of the museum to a space of ‘sociability, study and play in which the boundaries between everyday life and art, observation and participation are blurred’, Gaba also questions historical narratives of collecting by institutions. This makes the acquisition and inclusion of The Museum of Contemporary African Art as part of Tate’s programme to develop their Contemporary African Art collection even more interesting. Given my interests in art as artefact and interpretation, I’m drawn to artists using methods of museum display in their own work, as well as incorporating it into my installations. Therefore, I’ve decided to contact and interview artists who create museums as part of my research and present these on my blog. I’m hoping that this will give me more insight into why artists are drawn to the museum format and how this can be used to better understand existing museum and gallery collections. This week I headed down to London to see the London Art Book Fair at the Whitechapel Gallery. I’d visited previously a couple of years before when I exhibited there with AMBruno and found it to be a vibrant example of the art publishing world. Unlike the other artist book fairs which focus mainly on the work of artists who create and work with books, the London Art Book Fair also incorporates other types of art publishing, including monographs, journals and gallery catalogues. 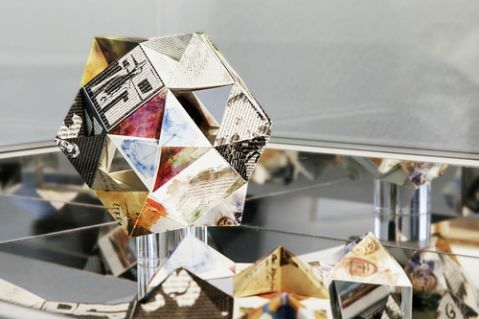 While this attracts big names such as the Hayward Gallery and MIT Press to the fair, I feel that it can also detract away from the artist book as a medium and make audiences more confused about how books can be art. Nevertheless, it was a busy and fruitful visit and, as with other artists book fairs around the country, there was a packed itinerary of events available to visitors. One of these of events was a risograph printing workshop, organised by Ditto Press, where participants were able to learn more about the risograph printing process and then make a print to take away with them. I’ve been wanting to learn about risograph printing for a while, as an alternative to screen printing, so it was great to have an opportunity to participate in the workshop. Risograph uses a duplication process by creating a master stencil from wax paper inside the risograph machine. The paper is then passed through the machine and soy-based single colour ink is pushed through the stencil onto the paper, one layer at a time. Additional layers of colour are created by producing a master stencil from another image and passing the paper through the machine again. This process is predicated on first separating your artwork into layers, as with screen printing. obviously, there wasn’t the scope or the technology available within the 2 hour workshop to produce complicated artwork separations, so we made simple images using drawing and collage techniques that could then be scanned with the risograph printer to produce our finished prints. This simplified technique was very useful as it gave me a good idea of how I might go about creating images in future, but I decided to do a bit more research into how to prepare artwork to create different effects. I found this guide to using different techniques to prepare artwork for riso printing particularly useful. Produced by Paperpusher in Canada, it covers everything from using opacity in colour interactions through to the register of the print. Colour interactions are created by using the combination of two overlaid colours to make a third (as shown on the image) However, although the final image is in colour, the artwork is prepared in black and white, with the darker tones producing stronger colours, and the less opaque tones creating more pastel effects. Other effects using two colour printing include duotones. Creating an image using contrasting colour halftones helps to draw out the midtones and highlights. 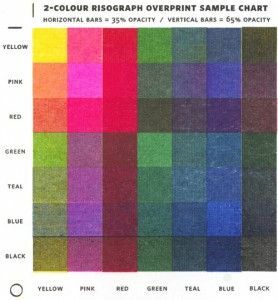 Halftones are the dots that make up an image (as in newspaper printing) and can be increased or decreased in size on the risograph machine depending on the preferred outcome. As riso printing is produced in layers, it isn’t always possible to align each layer perfectly with the one before. Equally, large solid areas of ink may not have as perfect a consistency as a digital print. However these discrepancies are usually minimal and create a more ‘handmade’ effect in the finished product. Although I wasn’t expecting to be introduced to risograph printing at the London Art Book Fair, it was a welcome addition to their programme, and I’ve already made contact with Footprint, my local riso printers in Leeds to determine how I might use the process in my work.